Eiffel Tower centerpiece; transform any table to an exotic trip to France. 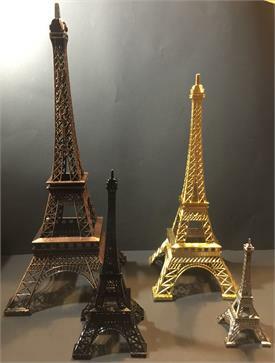 This miniature Eiffel tower makes an enchanting table top centerpiece with its stunning metal finishing and life-like details. These beautiful replicas of the Monumental Eiffel Tower will bring a chic French twist to your special event, with amazingly realistic and highly detailed structures and a pure French appeal. You can add some DIY factor to personalize these towers. This tower is great for embellishing a Paris themed party or bridal shower. Reach the skies, showcase your swankiness, and entice your guests by glamorizing the entire ambiance with the glitz and glam of our Treasured Affection!